Foyo has received more than four ceramic ball orders from PT. PLN (Persero) Pembangkitan Sumatera Bagian, a big power plant in Indonesia, to increase safety and reliability for their fly ash handling system. As for the fly ash handling system, high speed fly ash is extreme abrasive, and abrasion is the main problem for pipe valves and elbows. 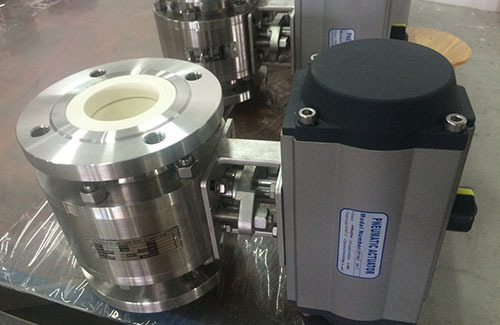 Generally soft seated and metal seated ball valves cannot last more than 3 months, frequent replacement and maintenance of the valves consumes too much manpower and cost, and also had a negative impact for the pneumatic conveying system. Foyo has more than 15 years' experience in ceramic valves designing and manufacturing. Especially in coal fired power plants and steel plants, Foyo ceramic ball valves have excellent performance and reputation. In October 2015, the end user, PT. PLN (Persero) Pembangkitan Sumatera Bagian power plant installed the first batch Foyo brand pneumatic ceramic full lined ball valves, Sizes DN50 and DN65, JIS 10K, 8 pcs for each size. Thanks to the high quality and excellent abrasion resistant, Foyo ceramic ball valves had proven their advantages compared to the other valves. 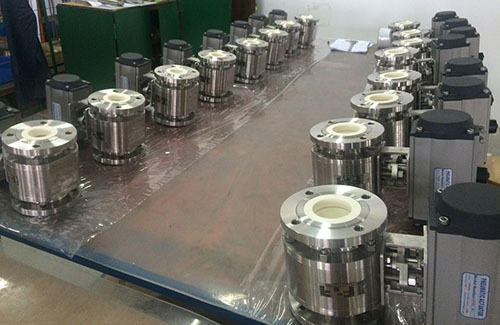 Only two or three months later, end user decided to purchase the second batch of Foyo brand ceramic ball valves . Up to January 2017, PT. PLN (Persero) Pembangkitan Sumatera Bagian coal fired plant has installed 4 batches, total 59 pcs pneumatic ceramic ball valves in their fly ash handling system. Foyo will continue to provide qualified ceramic ball valves and technical support for customers.